A fountain commemorates Samuel Blackall, who became Governor of Queensland in 1868 when he was fifty-nine. The foundation stone was laid on the 30th November,1880. The fountain was relocated to its present site in 1927 and restored in 1979. Governor Blackall contracted a terminal illness and died in 1871 after only a short period in office, but gained a high public regard in this time. He disagreed with the Queensland Government on the recruitment of Kanaka labour to which he was opposed. The ceremony of laying the foundation-stone of the memorial column of the Blackall fountain will take place at 5 o'clock this afternoon. His Excellency the Governor Arthur Kennedy has kindly consented to perform the pleasing duty. 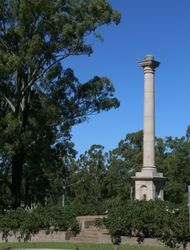 The monument is designed to perpetuate the memory of the late Colonel Blackall, one of the most popular Governors the colony has ever had, and whose death took place in Brisbane on the 2nd January, 1871. 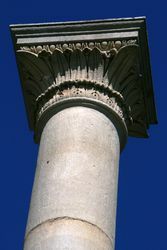 Soon after the lamented gentleman's demise, it was decided to erect some monument to him in Ipswich, and after many delays, and the consideration of numerous suggestions as to the form the memorial should take, it was at last determined that a drinking-fountain, surmounted by a column of stone, should be erected. This monument is now being built in Nicholas Street from a design by the Colonial Architect, Mr. F. D. G. Stanley, the contractor being Mr. C. A. Miller. BLACKALL MEMORIAL FOUNTAIN. At 3 o'clock on Thursday afternoon his Excellency, Sir Arthur Kennedy, after opening the show and inspecting the exhibits, proceeded to the Blackall Memorial, and formally unveiled the fountain and the tablets bearing the inscriptions. He expressed himself as feeling much pleasure in performing the ceremony, the more especially as the late Colonel Blackall was an intimate friend of his.